the scent of green bananas: four more years! 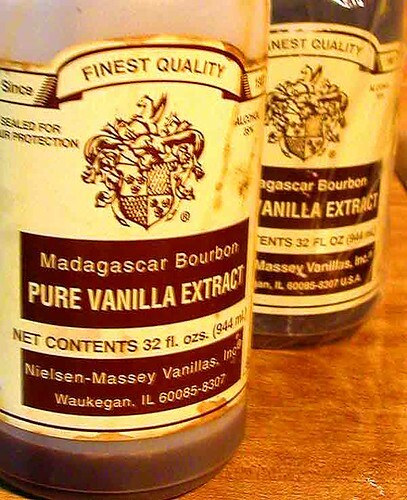 i bought this 32 oz bottle of madagascar vanilla extract sometime at the end of the second clinton administration, so actually, it has taken me about half a decade to finish it. i love this vanilla extract; buying it in large quantities not only means i always have it on hand, but that it intensifies in flavour to such dizzying heights of vanilla-ness, it's like grade A sugar cookie heroin. i was surprised to see there's probably only enough to finish off this year's baking frenzy, so i say adieu to a fine season of seasoning, and look forward to cracking open that second bottle. wheee. Posted by santos. This entry was posted on 20041220 at 10:36 PM You can skip to the end and leave a response. Oh my gosh - I've never seen the 32 oz size (and can't imagine what it must cost)! I love this vanilla also, but have only ever seen it in 4 and 8 ounces. I never thought about the possibility that it would intensify with age - that does make the large bottle sound enticing! it also comes in gallons! it's expensive, no doubt, but in the long run it's a relative bargain, as it is just a little more than the price of two 8 oz bottles of this stuff. and theoretically, you can get away with using less because it does intensify (the perfume of it when you first open the bottle is intoxicating), but of course i don't :-) if you decide to splurge, i've found that the king arthur flour shop has some of the lowest prices for this (although inexplicably, not for the smaller bottles). actually, i'm planning to experiment with making my own vanilla extract in the old bottle with some vanilla beans and vodka, i'll let you know how it goes. Clinton. Sigh. Those were the days. Mmmm bottle, heroin. Also, and this is a completely serious question, can you use it as perfume because I had a friend who always wore vanilla and she smelt just great. i'm pretty free and loose with it :-) and i think i probably do add it to most of my baked goods, even if it's not called for. but you know, i've been seeing these savoury dishes with vanilla used in the sauce and i wonder about that. does vanilla *really* go with snapper? apparently the scents that men are most attracted to are vanilla and licorice. so i'm told. doesn't influence my decision in making the comptoir sud pacifique perfume line--which used to be almost exclusively tahitian vanilla-based--my parfum of choice. nope, not one bit. nuh-uh. but you know, the alcohol content of the extract would make it an ideal and cheaper substitute to say, the $90 vanille canelle eau de parfum, which really does make you smell like a cupcake. 6-year olds love me when i wear this. 16,000 acres in Muntadgin. I'm sure we could accommodate you somewhere there. And speaking of cumquats, I finally enacted my cunning plan today with my cumquat tree. I took an empty bottle of one of those Italian soft drinks and placed it over a few buds and the plan is to let them grow inside the bottle and then pour brandy in there. I think small children are supposed to go wow how did they get in there? (Or even me if I forget). CHRIST ANTHONY YOU PLAN ON LURING LITTLE CHILDREN INTO BOTTLES WITH KUMQUATS??! effing brilliant!!! so much easier than chopping them up. oh, uh, i hear little kiddies crying in the background and a mob of angry mums. my apologies. sorry santa, sorry kids. Ha! I am so not going to tell my Johnny Walker joke.